In sixth grade English, the students read “Magnus Chase and the Sword of Summer,” a hero’s quest steeped in Norse mythology and written by master storyteller Rick Riordan. As an extension to the book, students studied a mini unit on the Vikings, learning background history, the Runic alphabet, and understanding how buoyancy and the Archimedes Principle factor into Viking longships. For the STEM Viking Ship Challenge, students chose partners and worked together using popsicle sticks, straws, duct tape, and clay to build a Viking longship that would withstand “high winds and sail the high seas.” The main criteria was that ships needed to be 12cm at their widest point, and they could not be 2.5 times longer than their width. 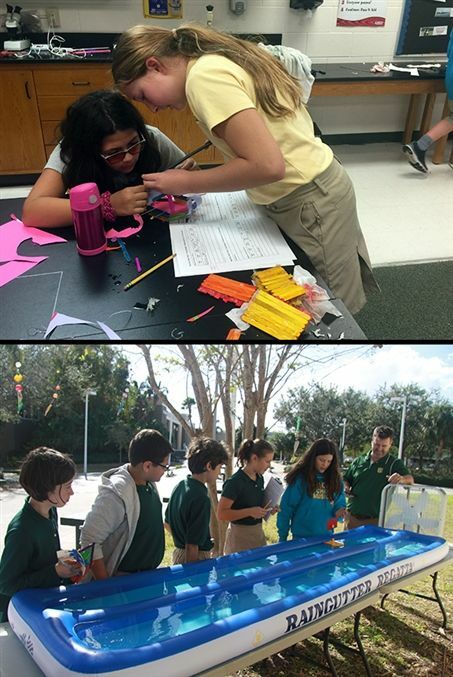 Sixth graders had four hours to plan, build, test/analyze, and modify/test their longships. Two long, inflatable pools and fans (to simulate conditions) were set up outside that the students used for test runs and time trials, and each team had a packet where they entered data. Initially, the students calculated the area of the sail and measured the mass of the ship. After the final races took place, data was analyzed including mean, median, range, and mode. Students also graphed the area of sail vs. speed and mass vs. speed and made some inferences on the relationship between those two variables. To evaluate and improve the project for future classes, students will write a reflection piece on the day and include ideas and comments on how to change up and make the project even better next year.